Oh my. I made it. I am there. There as in ready for my last two jewelry shows of the year, but in a bigger and better sense, there without the usual nervous breakdown that comes with getting ready for a show, which in this case is two shows, back to back weekends, three days each. I keep asking myself why I’m not freaking out more, why I’m not in tears they way I was for our last show, why I feel so calm, so centered. Maybe it’s not such a good idea to ask too many questions. Maybe it would be better to just say thank you and smile and feel the serenity that is resting at my core. And I’m doing that, I am. Really. But I can’t help but wonder. I’m curious, that has always been the case, I am always questioning this or that or trying to figure out the why or the how or the what if. I think that’s a good thing. And I’m glad, so glad that there are no tears and no frenzied mind and no complaining. This time, it all feels okay. And I’m just going to let my mind sit there in this okay place, because it’s a much better place than before. I’m going to enjoy this feeling of balance, I’m going to linger here in this light, this calm. I know it won’t last, don’t think I am silly. Tomorrow, or the next day, or the next, I will be hounded by my list and by overwhelm and by life. But today, there is just this frost on a dry hydrangea blossom left on a bush in my garden. Today that is all I need to make me smile. This entry was posted on Thursday, November 11th, 2010 at 7:56 amand is filed under . You can follow any responses to this entry through the RSS 2.0 feed. You can leave a response, or trackback from your own site. Savor it and thanks for sharing! I adore your hydrangea image-that alone welcomes meditation and quiet! Wow, two long shows back to back, that would be enough to send me into a tail spin. I’m doing my first show in about 3 years this Saturday, I have plenty of stock so I’m also feeling remarkably calm not having to scramble around making things at the last minute. Hope they’re amazing shows for you. How wonderful. Enjoy the moment Kelly – and the shows. I wish you the best experience! We had a warm front come through and last night I actually turned on the a/c. 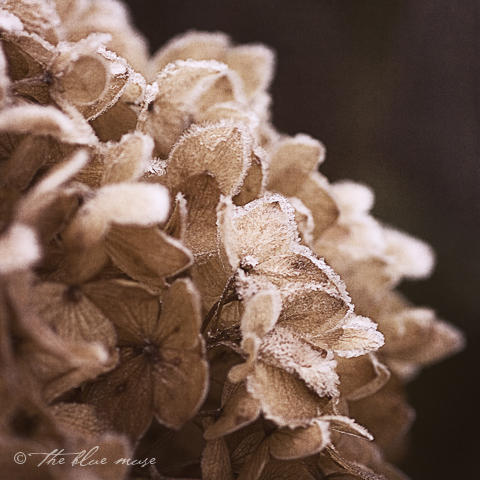 When I wake up to see this sweet frosted hydrangea, it feels like a whole ‘nother planet away. Enjoy the moment of peace..the centered serenity. You’ve earned it! A quote from George Mueller…”The beginning of anxiety is the end of faith, and the beginning of true faith is the end of anxiety.” Congratulations. with experience comes wisdom and a sense of calm. savor it and good luck! Enjoy the calm, you have earned it. Good luck at your show! I don’t know why this sort of thing happens to me either. Maybe it’s hormonal. Maybe it’s the gravitational pull of the moon. Or my diet. But whatever it is, I’m glad you’re in this good place and not the bad. I love where you were that day too…that moment you took that gorgeous shot. How beautiful, all covered with frost!